Are you all ready for another super fun mystery knit-along? Everyone had such a great time last year, I knew I would have to do it again this year. The pattern is now available in my Ravelry shop. Until the start date, February 28, the pattern file will only include the information you see here. Beginning on February 28, the download will include a new segment of the pattern. Each following Friday, for another 5 weeks, the pattern will include another new segment (each Friday, you should get a notice that a new update is available). The mystery part is that you won't know what the toy will be until the final week, although you are welcome to guess! You can join any time during the 6 weeks. I've tried to divide the pattern up as evenly as possible, but the first week has less knitting than the rest, so everyone will have a bit more time to join and catch up. If you'd like to join us, you can find the Ravelry thread here. If you're not a Ravelry member, you can still purchase the pattern after March 28, and get the weekly updates. Maybe you and a group of your knitting friends can have your own knit-along! The pattern is advanced-beginner to intermediate level. You will need to know how to work stockinette and garter stitch, increase (m1), decrease (k2tog and ssk), yo, cast-on stitches within a row, pick up stitches, sew seams, and the garment has sleeves that can be worked in the round (but that part is optional). There are many fun techniques in this pattern, so it would be a good chance to learn or practice new skills. Here are the yarns I've chosen for my toy. The Berroco Vintage yarn is a practical and affordable yarn for toys, and comes in lots of colours. 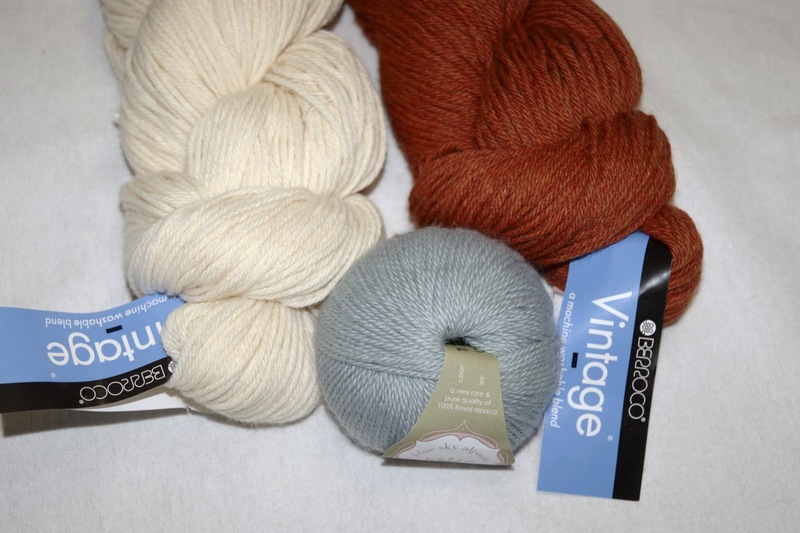 I'm going to use the russet (colour 5176) for my main colour, and the cream (colour 5102) for my contrasting colour. The Blue Sky Alpacas Royal Petites (colour 1708) is for the garment. It's a lovely, soft yarn, and I have a few spare balls that I've been using for small projects. *I've included the number of yards of yarn because I'm close to 45 g for the knitted pieces I've made for the sample. So if your gauge is off, or your yarn is thicker than what I've suggested, you may need more yarn. You know how I buy the knit-a-long pattern every year and then never actually knit-a-long? Not this year! I've actually finished the first week. GO ME! March 4, 2014 at 3:21 p.m.
May 20, 2014 at 4:04 p.m.